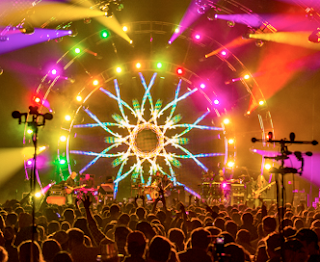 Paul Hoffman along with the WSP crew and Bandit Rigs recently put together the most spectacular Widespread Panic light show ever! Here are a few snippits from Live Design's recent interview, covering Paul's take on the production side, and some info about his equipment. The equipment at his fingertips included Vari*Lite 3000 spots, GLP Impressions, the new GLP Impression X4s, GRN LED Pars and GRN LED Battens from Bandit Lites, Clay Paky Sharpys, Maxedia Video Servers, Mirage Video Panels and GrandMA2 Consoles. To add to the energy of the New Year buzz, Hoffman used video, a new addition to Widespread Panic concerts.